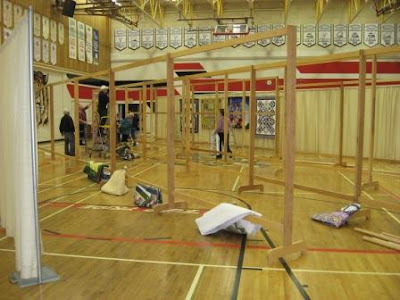 The Leduc Quilt show was this past weekend. 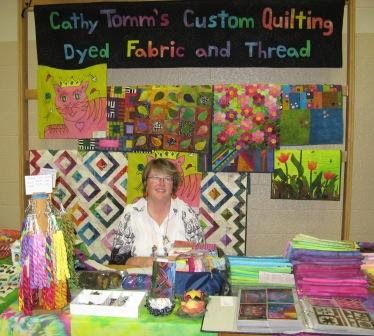 Here is me at my booth selling dyed fabric, dyed thread, buttons, and some jewelry made with polymer clay. I was also promoting my Machine Quilting. I had five quilts in the show but then you can see I had some at my booth as well. It was a good show with lots of room. The quilt show committee did a great job. Hats off to you ladies. 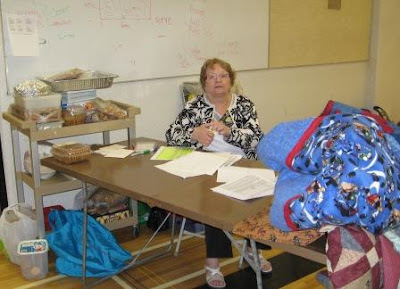 Here is June taking in the quilts and the cookies on Friday. We have the members make three dozen cookies and then serve cookies, juice and coffee. The men and kids love the goodies. The quilt stands all have to go up. My dad is always in there helping set them up. We get as many husbands as we can to come help with this part and again at take down. Next will be to hang. This is in the large gym of the local high school. We had the market mall in the smaller gym and the cookies and drinks in the cafeteria. 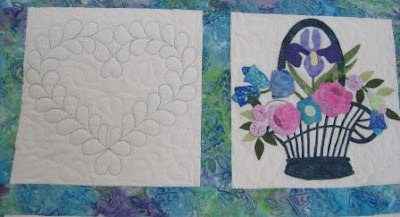 The first and the third quilt in this photos are mine. I am sorry to my fellow member but I do not remember who's quilt is in the middle. Crop Circles is the purple and green quilt, one of my original art quilts. Then at the back is Luminous Diamonds, a more traditional quilt for me. Luminous Diamonds is my original design and was published in the American Quilter this summer. My first published article. I believe you can still order back issues of the July/Aug issue. Here is a bigger view of the room and the large quilts. We had over 200 quilted items. We plan our show every two years. 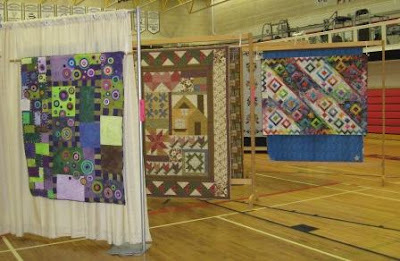 You have missed it this year but next Friday and Saturday, coming up, is the Sherwood Park Quilt Show. I do not remember were in the Park but I am sure you can find it if you are local. My next big sale is in Calgary in April. 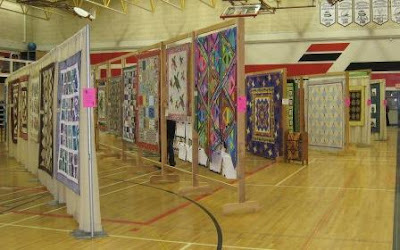 The Canadian Quilter's Association is having Quilt Canada in Calgary at the end of April 2010. Google it. I have a booth booked with a friend in the market mall. Came and say hi to me if you can go. 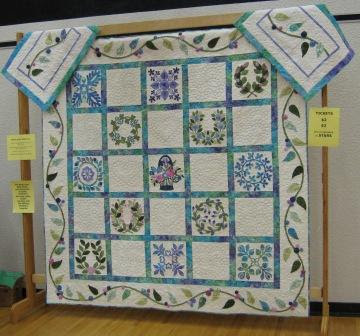 This is the raffle quilt that the quilt guild members made. They were selling tickets at the show. Half the money raised will be going to Stars Air Ambulance here in Alberta and the other will help with the cost of our friendship quilts and the cost of the quilt show. I believe the draw is in early November. I did the machine quilting on it. The members did the hand appliqued blocks. I know Marge and my mine mom each did a block. I forget who else, sorry I do not remember. I try to give credit for the work done by the quilters. You know who you are and you did a great job. Great job on the quilt show and the raffle quilt ladies.